This post is a loving tribute by Janaki Subramanian to her maternal grandma, Mrs Janaki Krishnamurthy. She has been featured in Adyar Times as one of the oldest living residents of Adyar area in Chennai. Along with her first name, Janaki seems to have inherited the love for cooking from her grandma. We first met Janaki at The Duchess Club where she is an enthusiastic member. A danseuse, journalist and an entrepreneur, she is passionate about anything that is linked to arts and culture. For those who are interested in knowing about her new venture, do visit Expressions Studio. At the Terra Madre Day last December, conducted by Jigyasa and myself in association with The Duchess Club, Janaki participated by preparing ‘Mor Kali’, a traditional VEGETARIAN snack from Tamil Nadu, a dish that is a favourite in her family and has been passed down from grandma to granddaughter. She says, “I chose this dish as it is simple to make and extremely tasty. It has the goodness of buttermilk, the tanginess of ginger and the spiciness of chillies. It is a healthy snack as it is made of organic rice. It is not deep fried and can be made in a jiffy. Most of all, this traditional dish of South India is almost forgotten and I wanted it to regain some of its lost popularity.” Intrigued by this simple snack and Janaki’s passionate description of her family’s culinary enthusiasm, we asked her to share this recipe by paying a tribute to her grandmother. Well, Well, I love to cook and I also love to eat. In my growing years, especially when I was in college, I used to help my mother in the kitchen. Though I never actually enjoyed helping her at that point of time, I now realize those initial years of training has stood me in good stead. My mother too used to help my Paati (which means Grandma in Tamil) in the kitchen while my younger aunt would entertain guests who came over. As a result, my mother became adept at culinary skills. 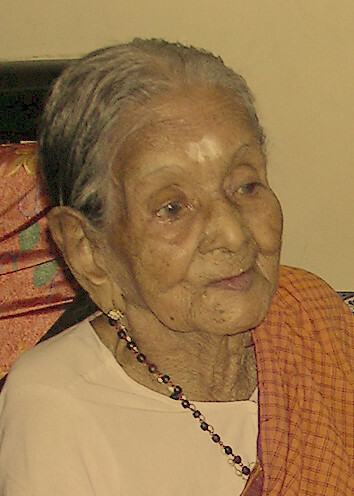 My Grandmother, Janaki Krishnamurthy, was a very vibrant personality. She got married when she was just 12 years old and lived mostly in Shimla and Delhi. My Grandfather served in the Ministry of Home affairs and had worked with national leaders like Sardar Vallabhai Patel and Govind Vallabh Pant, to name a few. She was an active Bridge and Carrom player and enjoyed entertaining people. I remember the distinct aroma of her filter coffee. My memories of my vacations in Madras (where she lived with my aunt) are filled with delicious food. The aroma of her tasty ‘Rasam’ made in Iya Chombu – iron vessel – is hard to forget. Incidentally, she was one of the oldest living person in Adyar. She passed away when she was 104 yrs old. With the influx of junk food like pizzas and burgers, and international cuisines like Chinese, Continental, Mexican etc, I feel that our own traditional delicacies are slowly being relegated to the background. I like to prepare traditional dishes of my region and community, as well as of others too. I feel that the taste, ingredients, preparation and the history behind each of our dishes is unique and should be cherished. I used to relish ‘Mor Kali’ as a child and now prepare the same for my husband and children who love it the same way! I am happy to share the recipe here. To tweak this into a Jain recipe, avoid the ginger. Jains can also prepare this recipe during Paryushan by substituting green chillies with dry red chillies, fresh curry leaves with dried ones, and fresh ginger with dried ginger powder. To make the batter, soak the raw rice for up to 2 hours and grind into a smooth batter. Add a cup of buttermilk to the rice instead of water while grinding. Add the remaining 2 cups buttermilk, salt and asafoetida into the batter and mix well. Heat a heavy bottomed pan and add 1 tsp oil. Add the mustard, urad dal and chana dal. When the gram turns golden, add the ginger and chillies. Now add the ground batter and allow to cook, stirring continuously so that no lumps are formed. Add a few drops of oil a couple of times. As you cook, the mixture will thicken and turn translucent. Immediately pour it on a greased tray and allow to cool. Chop into squares when cooled. Garnish the dish with curry leaves and serve either hot or cold with a variety of chutneys or pickles. One of my favourite accompaniments is fried Mor Milagai (chillies cured in yogurt).